Arrange candy melts in rainbow order in a 9-inch microwave-safe baking dish. Microwave on High in 30-second bursts until candy becomes soft and melted. 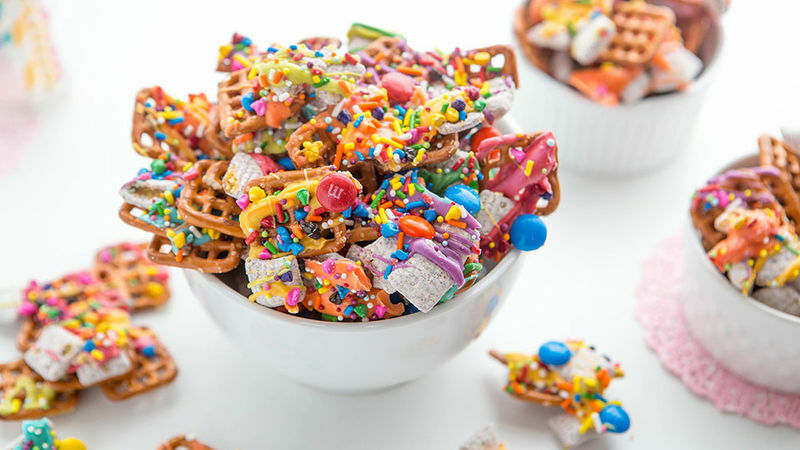 With a spoon, gently stir each color to soften, then drizzle over a small portion of the pretzel mixture. Sprinkle with candies, nonpareils and jimmies before drizzling the next layer of color. Once the candy melts have set, gently break up the mixture into bite-sized chunks. Serve and enjoy! Savory Chex® Mix basically makes a party. But what if your Chex® Mix could BE the party? We’ve taken the traditional, turned it sweet and upgraded it with so many colors of the rainbow. Chex® Mix. Muddy Buddies®. Pretzels. Perfection. Here’s how to make this wildly easy snack at home. Then toss ‘em on a parchment-lined baking sheet with some butter-flavored pretzel waffles. You will now need every color of candy melts ever. Arrange them side-by-side in a microwave-safe dish, then microwave until melted. Since we’re rainbowing here, you don’t have to worry about the colors all being melted into each other. When you drizzle, it’ll all kind of magically work out. Speaking of drizzle… once your candy melts are melty, stir each little section gently until smooth, then drizzle on top of your Chex® mixture. Before moving on to the next color, give a little sprinkle of rainbow sprinkles and rainbow chips and rainbow candies. Then allow it all to cool until the candy melts firm up. Gently crack into pieces. Then snack your heart out.